MANGIA MONDAY: Every Monday is Mangia Monday! For just $20 you'll receive a ticket to the game, PLUS an all-you-can-eat buffet for 7 innings in the Hank Sauer Room of Legends! It's the perfect way to start your week! For Tickets to Mangia Monday Click HERE! 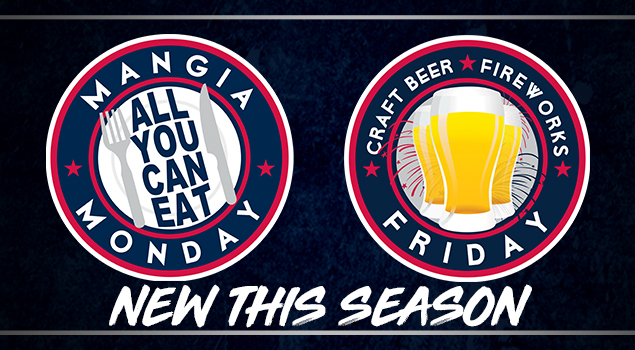 CRAFT BEER FRIDAY: We are expanding our love for craft beer and bringing something new to fans on Fridays. For just $20, fans 21 & older will receive a ticket to the game and (2) craft beer vouchers. There will be something different and unique on tap each and every Friday. If that's not enough, fireworks will follow every Friday night home game. Craft beer and fireworks…need we say more? For Tickets to Craft Beer Friday Click HERE!